Home > Posts > Cleaning tips > Where should the detergent go in the machine? Whichever cleaning product you use (powder, liquid, pods, etc), it contains detergents—surfactants that tackle stains. There may also be whiteners in your detergent, as well as enzymes, active oxygen, and so on. Which cleaning product should you use? Powdered detergents foam less than liquid ones. It is recommended for high temperature washes (over 60°), especially for whites or very dirty laundry. Avoid cold washes (30° or less): washing powder may leave white traces on your laundry. Liquid detergent is enhanced with active ingredients and is more suitable for getting rid of stubborn stains. It is easily diluted and suited to cold cycles (between 30 – 40°C°). Washing liquid is recommended for colors and synthetic items. Pods contain liquid detergent, while tablets are made of washing powder. These pre-dosed options prevent waste and excess use of detergent; they are considered to be more eco-friendly. Which tray does the detergent go into? If your laundry is very dirty and needs a pre-wash, put your detergent in the first tray. Add detergent to tray 2 for the main cycle. For a normal wash, put your detergent in tray 2. You may want to use a wash ball. And what about the tray with the ‘little flower’? This tray is for softener. Note: to get rid of the most stubborn stains, check out our washing tips. 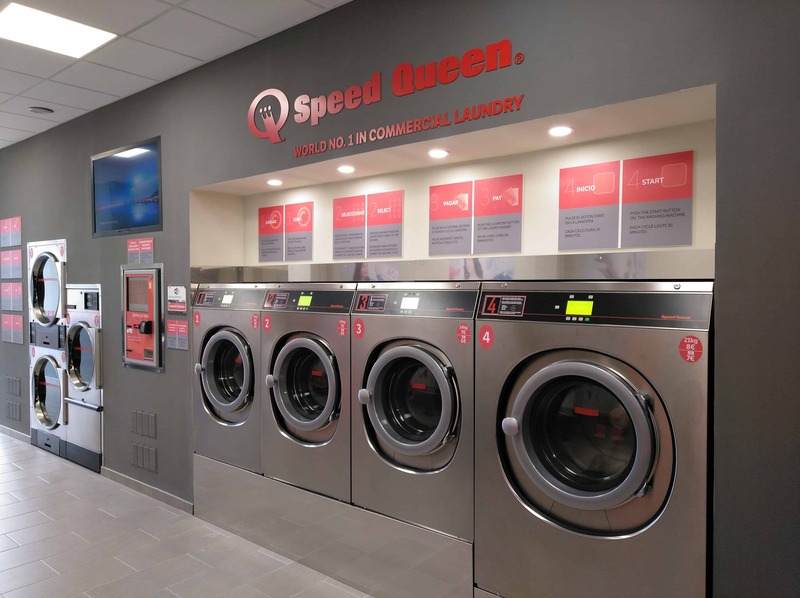 Speed Queen laundromats are equipped with the best professional washing machines on the market. At our stores, you’ll find detailed instructions on how to correctly use your detergent and achieve the best results possible. Find the closest laundromat to you.